Is there anything more intimate than cleaning out another person’s home—deciding which of her possessions, collected with love or without thought, is important enough to keep; and what, then, to do with the rest? Aside from the fact that it usually comes with some degree of sadness, the process requires a set of emotional gymnastics, a series of shifts from empathy to self-interest and back again: This thing is archival or an important memory marker; this meant something to her so it now means something to me; this did its duty but now can be set free; this has no conceivable use for anyone, ever. Family photographs are easy (keep). Recipe clippings from the 1980s are easy (dump). 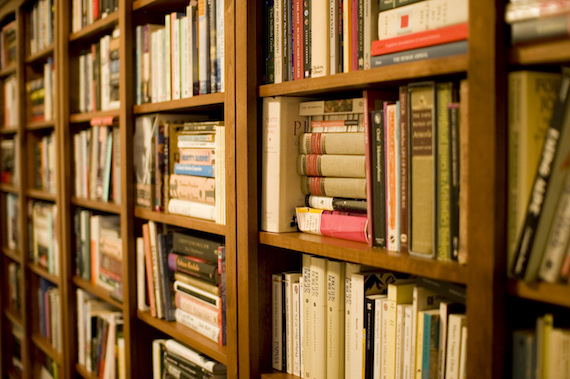 Books—or rather a library, as opposed to a half shelf of bestsellers in the corner of the family room—are almost never simple. A library embodies the trajectory of a life and intellect, and to sort, Solomon-like, through someone else’s story in books is a responsibility not to be taken lightly. The process, the responsibility, intensifies when this person is your mother. It took my sister and me under a minute to split up the labor of cleaning out our mother’s apartment when we finally moved her to a nursing home. Her dementia had reached the point where even a full-time home health aide couldn’t give her the care she needed, and when mom landed in the hospital after refusing to take a round of antibiotics for an infection, it was time. Fortunately, we found a great facility that accepted Medicaid. Unfortunately, that gave us a hard deadline for selling her co-op: once her Medicare-allotted time ran out, Medicaid would then siphon off all her money, including what we needed to pay the mortgage. We had a couple of months; sentiment would have to take a back seat to expediency. So my sister and I agreed: she would go through mom’s clothes, jewelry, and furniture; we’d split the kitchen; and I’d sort the office and art supplies, general paper ephemera—magazines, recipes, photo albums—and her hundreds of books. This last not only because I’m a “book person,” but because I had a long-term and complex relationship with those books of hers. Which is, I guess, exactly what being a book person means. Books had always been a language my mother and I shared when she was well: we gave them to each other as gifts, borrowed, traded, talked about what we’d read. Then, as her 10-year descent into dementia accelerated, her books took on a separate identity for me, their simple presence becoming a sort of animal comfort. Whenever I found myself at a loss with her—when she snapped at me and told me to leave, or, some years later, would doze off mid-sentence, or, even later, when her aide would be cleaning her in the bathroom as mom screeched and swore and swung—I would stand by the floor-to-ceiling bookshelves and read the titles over and over, cataloging them in my mind the way you rub a worry stone in your pocket. Her library was unself-conscious in the extreme—potboiler mysteries filed alphabetically with classics, paperbound galleys next to handsome hardcovers and golden-age, mass-market paperbacks from the ’50s, ’60s, and ’70s. Her frayed clothbound sets of philosophy and history ruled the top shelves, with oversized art books stacked horizontally on the bottom. Many were gifts from me. Across the room, lined up on end tables, were more recent acquisitions—offerings to tempt her back to reading after the concussion that started her decline, though I’m not sure she ever got to them. I gave her Geraldine Brooks’s People of the Book, Jean-Dominique Bauby’s The Diving Bell and the Butterfly. From my nephew, Peter Carey’s Theft, Carlos Ruiz Zafón’s The Shadow of the Wind. From I-don’t-know-who, The Help—which, bless her, mom would have adored. She was a sucker for stories of love and kindness redeeming all, and equally unconcerned with subtexts of class, race, or politics of any kind. In fact, for someone who so loved the intellectual intricacies of philosophy, mom flinched at anything morally difficult. Deeply non-confrontational in real life, she let her various blind spots carry over into her intellectual life. She didn’t like to follow politics, she told me when I was a child, because “everyone is so nasty.” And while she approved of broad-brush liberal issues—civil rights, the women’s movement—she did not like anything that made her uncomfortable: cruelty, suffering, ugliness, the moral conundrum of otherwise good people behaving badly. The notes I retrieved from her philosophy books, scrawled on bits and pieces of paper, stuck firmly with the epistemological: what is reality, what is the nature of consciousness, how do I fit in with the world?—phrases and questions written out in her neat, even script, connected by endless ellipses. For all our lively highbrow discussions, there were places we just did not go. Politics was one; religion another. My father, raised an Orthodox Jew, was a vehement atheist, and religion was something of a dirty word in our house. My mother seemed to have no strong ties to religion, or faith of any kind, even after my parents divorced and she was free to practice what she liked. But I wonder, now, if the enforced nonbelief of her marriage to my father was a loss for her. She grew up in a loosely observant Jewish tradition, but I never got a sense of whether those habits—which carried through to her first marriage but not her union with my father—were a source of comfort or a burden. Even more, I wonder what, beyond her enjoyment of solipsistic thought puzzles, comprised her inner life. For all our shared talk of art, literature, anthropology, science, and the general nature of the cosmos that sparked in me a deep hunger for knowledge as a child and young adult, I don’t recall our conversations going deep. Nor did Mom and I go to the mats, ever, when we disagreed. I regretted this the moment that possibility disappeared with her cogency—what had I been thinking, not to push her to explain her beliefs, not to help me figure out some of my own intellectual lineage? In his recent family memoir, The House of Twenty Thousand Books (New York Review Books, 2015), journalist and professor Sasha Abramsky draws on a similar process of reading bookshelves—as well as books—as a way in to the heart and mind of his beloved grandfather, Chimen Abramsky. The son and grandson of learned rabbis, Chimen was a renowned collector of modern Judaica and socialist literature—“modern” referring to anything published in the past 500 years—consisting of books, prints, and manuscripts. He eventually amassed an enormous private library that included Karl Marx’s handwritten letters, an early edition of The Communist Manifesto annotated by Marx and Friedrich Engels, an early 16th-century Bomberg Bible (one of the first printed Hebrew bibles), and first editions of Baruch Spinoza and René Descartes. The London row house where Chimen lived with his wife, Mimi, was double-shelved, floor to ceiling, with books collected over a lifetime, and after Chimen’s death in 2010, Sasha revisited that collection, room by room and shelf by shelf—to paint a portrait of his grandfather as both scholar and family man, to tell the story of his own lineage, and—with evident discomfort—to try and puzzle out the dissonance of Chimen’s decades-long embrace of communism. What I don’t realize going in is just how phenomenally awful it really is, just how much he had bought into the cult of the personality. It leaves me gasping for breath, makes me want to run into a shower and scrub myself clean. This isn’t the sweet old man I loved so much; this isn’t the insightful humanist, so suspicious of even a whiff of totalitarianism and who so prided himself on his friendship with the great liberal philosopher Isaiah Berlin. From my early childhood days, Chimen taught me how to interpret the world around me, how to use ideas carefully to create patterns out of chaos. And this, perhaps, is why my somewhat obsessive inventory of my mother’s bookshelves gave me comfort in her final years at home. Even if she was now largely the source of the chaos in my life, once upon a time she taught me well. I siphoned books out of my mother’s library for years. Though mostly with her approval: she had boxed up a wonderful collection of art, design, and photography books during one downsize or another, and she gave them to me once I moved into a house large enough to hold them. Periodically, I’d ask and borrow random items. And in later years I just took stuff. Sometimes after an extra challenging day with her, spiriting a book home would be my reward. Sometimes my ritual gaze would turn covetous, and though there was no reason not to “borrow” whatever I wanted, the thought that I was taking from someone else’s shelves without permission felt vaguely transgressive. Still, the need to console myself was stronger than the taboo; my copy of Jo Ann Beard’s Boys of My Youth will be forever linked in my mind with one early morning I had to race up to her apartment when, on one of her aide’s rare days off, mom had locked the replacement caregiver out and called the cops. And yet—once I was alone in her apartment with a stack of boxes, tasked with this move, and her books were all mine to do with as I liked, I knew one thing right away: I didn’t want them. In a different world—maybe a better one—I would have incorporated my mother’s library into my own. Not the crap, of course; not the ARCs, the mass-market potboilers, the bad sci-fi. (I did keep a galley of The Da Vinci Code for novelty’s sake, though I doubt it will ever be worth anything since mom, as she did with all her books, wrote her name in it.) But the lovely old clothbound sets, her collection of Modern Library philosophy, the mid-century novels that epitomized her generation of readers—Saul Bellow, Vladimir Nabokov, John Updike—could have come home with me. I could have bought more bookshelves and absorbed her eclectic collection into mine in a traditional, intergenerational meeting of minds. But I don’t have much sentiment for tradition, and, more practically, I’m not an aspirational reader. (My shelves and iPad give lie to that statement, of course—I own far more books than I’ll be able to read in a lifetime.) What coheres my own collection, though, is that every one of them is a book I might read. Though abstractly the possibility of reading Spinoza or Descartes or The History of the Decline and Fall of the Roman Empire lights a little fire in my heart, as I imagine the smarter, wiser, better-informed person I could become, I’m also a realist. I’m not going to read them. So I packed her books up, going through each with an eye out for personal inscriptions, dollar bills, or the photos she liked to use as bookmarks. I filled about 20 boxes from U-Haul, and dropped them off at her local library, five boxes at a time, as per Friends of the Library instructions. It took my back nearly a month to recover. I did keep a few items: a boxed set of books written by my father, none of which I owned; a lovely oversized book of Käthe Kollwitz drawings, given to mom on her birthday the year I was born and inscribed with extravagant love (“For my liebchen”) by my father; a two-volume set of 1967 Gourmet cookbooks, fat and impractical with cracked leather bindings, full of recipes I can’t imagine wanting to cook, but with a marvelously cringe-inducing ’60s inscription, again from my father: “To Rhoda, Feed me! Happy birthday, with all my love;” a trade paperback copy of Susan Sontag’s On Photography. The rest I let go. I was surprised at how easy it was. My mother’s Tarrytown co-op was no house of 20,000 books, and her 600-odd-volume library had nothing on Chimen Abramsky’s. But they shared the same bloodline. They don’t call us Jews the People of the Book for nothing, and although the label is originally about Judaism’s relationship to the Torah, how for millennia it has been treated as a live text that invites engagement and discourse, there’s also a cultural reverence for books and education that—while not unique to Jews—has been a given for generations of Jewish families. My parents were certainly the product of that loyalty, products of New York public schools who passed through the City College system and eventually met at Columbia. In our family, learning—which is to say reading—meant mobility and access. My mother and Chimen Abramsky both loved those little Everyman’s and Modern Library books, with their egalitarian promises of knowledge for all: as Sasha Abramsky says, “They were books produced for every man, at a moment when it was quietly assumed that people in England of all classes and all walks of life were interested in bettering themselves intellectually.” Substitute Brooklyn or the Bronx for England, and you have my family’s intellectual history encapsulated. Like Abramsky’s, my mother’s library was aleatory and curated solely around her interests. While his enthusiasms lay along more scholarly lines, and although he collected around themes—Judaica, Socialism, Marx—there was still, in both their libraries, a deep faith that had nothing to do with organized religion and everything to do with the power of the printed word to elevate, expand, and explain. And, as I am doing now, Sasha Abramsky revisited his grandfather’s library through memory only. Other than a few items that he and family members kept, the rest of his grandfather’s collection was boxed and sent off; not to the local Friends of the Library, of course, but to be appraised and sold. Utility took precedence over sentiment for Chimen’s library, as with my mother’s, and the books went on to a new life with new readers. Someday my son will have to pack up all my books and decide what he wants to keep and what goes to the library sale, if there still is such a thing. I don’t need to make his future job harder just because I like the look of an erudite collection on my shelves, or because I want to try my hand at reading what my mother read to see if that makes me any more able to imagine what she thought. It won’t, because I can’t. It’s enough that she instilled that love of far-ranging, inquisitive reading in me. And maybe someone will pick up that battered set of The Great Philosophers for $5 at the Friends of the Warner Library book sale and it will be their gateway to great thought. Or maybe it will go unread and be packed up, someday, by their children, and the cycle will begin again. Lampedusa was afflicted with several handicaps (not so much to being a writer, but to being thrustful enough to dream of, and then achieve, publication): extreme shyness; enough money never to need take a job [he was a prince]; plus a sense that, as a Sicilian aristocrat, he came from an exhausted, irrelevant culture. There were other factors too, including a major nervous breakdown in his 20s, and a domineering mother. The roots of such unthrustfulness notwithstanding, one laments whatever convergence of factors precluded Lampedusa from a more prolific literary career. I first fell in love with Il Gattopardo via Luchino Visconti’s sumptuous film version (I’d seen it three times in fact, before reading Lampedusa’s original). It is unusual for me to read a book after seeing the film adaptation, but I was aware that some had criticized Visconti for staying, believe it or not, too close to the novel. I was thus eager to read it, and it has become, like the film, among my very favorites. One indisputable factor that deprived us of more opportunities to luxuriate in Lampedusa’s gifts was a diagnosis of lung cancer in the spring of 1957, at age 60. The diagnosis came just a few months after he finished the novel. He had two publisher rejections already in hand, a third would arrive weeks before he died in July of that year. The author note of the Pantheon edition goes as far as to say that this third rejection came from an Italian editor who told him that his novel was ”unpublishable”—that Lampedusa, in other words, died with that declaration stamped upon his late-blooming artistic soul. One wonders just how shaped Lampedusa was by his exhausted, irrelevant culture, as he in fact lived a life highly atypical of a Sicilian of his era: influenced by his mother’s cosmopolitan bent, he was educated in Rome, read Latin and Greek, spoke German and French, and (almost unheard of at that time) eventually studied English. He served briefly as a lieutenant in the army during World War I and was imprisoned in a POW camp in Hungary. After the war, he traveled throughout northern Italy and Europe, and while visiting his uncle in England — of whose literature and culture he became (scandalously, for a Sicilian) enamored—he met Alexandra “Licy” Wolff Stomersee, a Latvian aristocrat and intellectual who studied psychoanalysis. The couple wed at Riga in 1932, in the Orthodox Church—another shocking departure from Sicilian cultural tradition—but eventually they lived apart, after his mother (domineering, yes, although some accounts additionally deem her “eccentric” and “open-minded”) forced her only son to choose between the two women. Licy was apparently no match for Signora Beatrice. He spent the late years of the Second World War near the coastal town of Capo d’Orlando in Messina, with his mother and cousins, where he also reunited with his wife. After his mother died in 1946, Giuseppe and Licy returned to Palermo, where Lampedusa lived out his mature years, doing very little, strictly speaking: according to Barnes (whose source is David Gilmour’s biography, The Last Leopard), “on a typical day, he might first visit the bookshop and cakeshop, then sit reading in a cafe for hours, return home for tea and buns, and perhaps go out to the film club in the evening.” While most accounts confirm Lampedusa’s extreme taciturnity—a most “shut in” personality, someone you “met but did not know”—it was during these years that he began meeting regularly with a group of young intellectuals to discuss French and English literature. Everyone, indeed—even this Korean American woman living in New York City circa 2012. One’s love for Il Gattopardo is nothing if not a love for Don Fabrizio, a lusty middle-aged nobleman, the last of his kind at a time of social and geopolitical upheaval, with a passion for mathematics and astronomy, a soft spot for beauty and charisma, and a “certain energy with a tendency toward abstraction, a disposition to seek a shape for life from within himself and not what he could wrest from others.” He is a character with whom anyone who has found herself cultivating an independent soul, by choice or by necessity, feels an intimacy. At this point, the Prince is primarily worried about domestic matters—the gradual but inevitable disintegration of his royal wealth into the hands of the new money classes. He is also worried about his sweet but unsophisticated daughter Concetta, who is in love with her dashing cousin Tancredi (Alain Delon in Visconti’s film version), whose fortune was squandered by the Prince’s brother-in-law and in whose future, political and social, the Prince sees great things. And he is worried for Tancredi’s impending engagement, around which the bulk of the novel revolves—to the enchanting Angelica (a young Claudia Cardinale, who else? ), whose father, Don Calogero di Sadera, is exemplary of these crude rags-to-riches merchant classes in whose hands the future of Sicily, not to mention great sums of wealth, seem to lie. found an odd admiration growing in him for Sedara’s qualities […] he began to realize the man’s rare intelligence. Many problems that had seemed insoluble to the Prince were resolved in a trice by Don Calogero […] he moved through the jungle of life with the confidence of an elephant which advances in a straight line, rooting up trees and trampling down lairs, without even noticing scratches of thorns and moans from the crushed. We are old, Chevalley, very old. For more than twenty-five centuries we’ve been bearing the weight of a superb and heterogeneous civilization, all from outside, none made by ourselves, none that we could call our own. […] I don’t say that in complaint; it’s our fault. I belong to an unfortunate generation, swung between the old world and the new, and I find myself ill at ease in both […] but I am without illusions; what would the Senate do with me, an inexperienced legislator who lacks the faculty of self-deception. in effect the last Lampedusa, whose own cultivated melancholy, totally without self-pity, stands at the center of the novel, exiled from the continuing history of the 20th century, enacting a state of anachronistic lateness with a compelling authenticity and an unyielding ascetic principle that rules out sentimentality and nostalgia. If I am reading Said correctly, he is associating lateness with both authenticity and asceticism, as well as a cultivated melancholia and exile. I prefer these associations to Barnes’s mere “unthrustfulness,” which Barnes (or perhaps the biographer Gilmour) in turn ties to exhaustion, irrelevance, reticence, nervousness, and submissiveness; for Said’s more appreciative assessment of “anachronistic lateness” applies not only to Lampedusa, but, it seems to me, to many of the late-life bloomers we’ve seen in this series; and to many of the artists I personally most admire. Isabel Bolton has fallen into obscurity a second time. How and why does this happen? What accounts for the failure of a work to catch hold, in spite of outstanding reviews? One of the more iconic ad campaigns of my youth was Blackglama furs’ “What Becomes a Legend Most?” — each installment featuring a grande dame of the day swathed in mink. Had Isak Dinesen lived long enough — she died in 1962, six years before the series began — she would have been a natural choice: all sharp angles, hooded eyes, and hauteur. By the end of her life Dinesen had indeed become a kind of dowager empress, living on grapes and oysters, champagne and cigarettes, holding court until she literally dropped from exhaustion and then dictating to her secretary while flat on her back. In a 1957 New York Times interview, she was asked, “Do you then look on your own life as a ‘tale’?” “Yes, I suppose so,” she replied, “but in a sense only I can grasp. And, after all, the tale is not yet quite finished!” It could hardly have been easy toward the end, or even particularly enjoyable. But for someone who nurtured an unmistakable ideal of high drama from childhood, and a writer’s sense of life as a narrative arc, how else could she have lived? Karen Christentze Dinesen, nicknamed Tanne, was born on Denmark’s coast just north of Copenhagen, in 1885. A stormy and creative child, Tanne balked at her mother’s moral restraint. Her father, on the other hand, was her idol, swashbuckling and at ease in the world. They took daily walks together and he told her tales of his time hunting and trapping in America, his cabin in Wisconsin, his kinship with the local Chippewas. These attentions confirmed what she had always believed — that she was special, destined for greatness. When he committed suicide she was left, at age ten, to make sense of her story alone — and she would keep doing so for the rest of her life. She was always a writer and a doodler, and notebooks full of her early work — essays, dramatic tales of love and woe, and marionette plays — still survive. Her early training was as a painter, but she was a product of her mother’s bourgeois world, where art was merely a hobby, and never settled on a course of study. At 19 she wrote a series of ghostly tales titled “Likely Stories” — an obvious precursor to Seven Gothic Tales. A friend arranged for the editor of Tilskueren, a Danish literary journal, to look at them, and eventually three were published, under Osceola — the name of the dog that had accompanied Tanne and her father (himself a writer, who had published an account of his youthful adventures in America under the pen name “Boganis,” the Chippewa word for hazelnut) on their long-ago walks. Dinesen identified with her father for most of her childhood and adolescence, scorning what she saw as her mother’s staid values and lack of sensuality. Yet she herself was a bit of a prude, and deeply old-fashioned. While her fiction enthusiastically delved into humanity’s darker side, she still felt most comfortable setting it far from her own experience, a century or more in the past. And it’s not surprising that she would marry a man like Bror Blixen, a brutish kind of fairy tale prince. Not only was he handsome, tough, and macho — he’s popularly believed to be the model for Hemingway’s great white hunter, Robert Wilson, in “The Short Happy Life of Francis Macomber” — but he was titled: the Baron Bror von Blixen-Finecke. They were engaged in 1913. While in most respects they were a mismatched couple, both craved novelty and excitement. When Blixen’s uncle returned from a safari to British East Africa rapturous over the countryside — “Go to Kenya, you two,” he said — they convinced relatives to invest in a 4,500-acre coffee plantation near Nairobi, and emigrated in 1914. As it turned out, the farm’s soil and rainfall were inadequate, and the project was most likely doomed from the start. Nonetheless, Africa was an intensely fertile place for Dinesen herself. Her 14 years in the Ngong hills would forge her into the artist — and the character — she would become. For much of that time, she didn’t write. Her responsibilities kept her busy, and she soon collected a wide circle of friends. These weren’t only her fellow white expats; she became deeply involved in the lives of the natives. Tanne — now calling herself Tania — grew to appreciate the straightforwardness of the local Kikuyus, Masai, and Somali. Notwithstanding an evident colonial attitude typical of her time and station, her affection for them was genuine and respectful. She gladly took on the role of doctor, advocate, educator, and admirer. In Kenya Dinesen came into her own as a storyteller, a kind of self-fashioned Scheherazade, and as she learned their language she discovered that the natives were an enthusiastic audience. Nights were long on the farm, and she fell into the tradition of spinning tales for a spellbound crowd. It was also, within that first year, when she discovered that her indiscriminately unfaithful husband had given her syphilis (of which she was never fully cured, probably the cause of her chronic ailments later in life). Her divorce wasn’t finalized until 1925, and later she would admit to a friend, “If it didn’t sound so beastly I might say that, the world being as it is, it was worth while having syphilis in order to become a Baroness.” In the meantime, between bad weather and the Baron’s mismanagement, they had managed to lose the farm. Dinesen was depressed, and the inconstancy of her lover, the handsome, mercurial Denys Finch Hatton, didn’t help. In an attempt to combat despair she began, at age 40, to write in earnest: “I was young, and by instinct of self-preservation I had to collect my energy on something, if I were not to be whirled away with the dust on the farm roads, or the smoke on the plain.” Out of this dark time emerged drafts for parts of Seven Gothic Tales, Winter’s Tales, and of course Out of Africa and Shadows on the Grass. In all her fantasies she was her own heroine, and she ran through the sphere of the seven deadly sins with the ecstasy of a little boy who gallops through the great races of the world upon his rocking-horse. No danger could possibly put fear into her, nor any anguish of conscience spoil her peace. The book was turned down by European publishers, but her brother Thomas passed it on to a reader in the United States, who sent it on to publisher Robert Haas. She chose a new pseudonym for the work in order to confound any gender expectations: Isak Dinesen — Isak being Hebrew for “the one who laughs.” And laugh she did, as the book’s success ended up attracting the interest of the same British and Danish presses that had turned her down initially. At 50, as her literary star started to ascend, her physical deterioration also accelerated. Dinesen responded by moving on to the next project. In Out of Africa, she shifted from folktale to memoir, painting a gorgeous, lyrical picture of her time in the Ngong hills. She may have polished some events to a high gloss, and skipped over others — her marriage and illness, for instance — entirely. But the book is no less stunning for it, particularly her descriptions of native life, both human and animal: giraffes “in their queer, inimitable, vegetative gracefulness, as if it were not a herd of animals but a family of rare, long-stemmed, speckled gigantic flowers slowly advancing”; a couple of rhinos who “looked like two very big angular stones rollicking in the long valley and enjoying life together”; elephants “pacing along as if they had an appointment at the end of the world.” The prose swoops from loving attention to detail to the expansiveness of the land as viewed from Finch Hatton’s bright yellow biplane — “In the air you are taken into the full freedom of the three dimensions; after long ages of exile and dreams the homesick heart throws itself into the arms of space” — in a way both intimate and thrilling. Published in Europe and America in the fall of 1937, the book was enormously well received and cemented her reputation. In 1985 Sydney Pollack’s film version, starring Meryl Streep as Dinesen and (a jarringly un-British) Robert Redford as Finch Hatton, brought Dinesen’s work to a wider audience. [H]e was down by the harbor and stood upon the wharf, his portmanteau in his hand, gazing down into the water. It was deep and dark, the lights from the lamps on the quay played within it like young snakes. His first strong sensation about it was that it was salt. The rainwater came down on him from above; the salt water met him below. That was as it should be. He stood here for a long time, looking at the ships. He would go away on one of them. To entertain herself during the tedium of the occupation, Dinesen next turned to crime fiction with The Angelic Avengers, her “illegitimate child” — a novel she considered such a throwaway she wrote it under the pseudonym Pierre Andrézel, denying any connection to the book even in the face of its popularity. Her health declined further, exacerbated by reliance on amphetamines and, probably, anorexia, but she continued to write: in 1950, “Babette’s Feast” was published in Ladies Home Journal; then followed Last Tales, in 1957, and the lighter Anecdotes of Destiny in 1958, as well as scattered essays and stories. In 1960, she gathered the last of her African notes into a short epilogue to Out of Africa titled Shadows on the Grass. The tale of Isak Dinesen, Baroness Karen von Blixen-Finecke, Tanne and Tania, finished on September 7, 1962. Her final years were filled with endless hospitalizations, and she spent much of the second half of her life lonely for a soulmate. But she was her own work of art, her own carefully woven and rewritten story that she controlled both on the page and in life. A bereft child, a conflicted adult, and a difficult, demanding old woman, she managed to remake the dark places of her life into the stuff of fables, herself into their fearless conjurer. And her time in Africa, which ended in bankruptcy, illness, and heartbreak, became poetry. When Eugene Walter, in a 1956 Paris Review interview, asked what had taken her so long to write about her experiences, she explained, “I was a painter before I was a writer. . . and a painter never wants the subject right under his nose; he wants to stand back and study a landscape with half-closed eyes.” Dinesen studied her landscape well, and over time, she became “her own heroine,” severe and uncompromising, an iconic role she earned with some of the last century’s most evocative writing. And we are all the more fortunate for that. McNair is inventive, original, and has a particular talent for finding language that is surprising without being showy. But his real skill is his deep familiarity with the South as a place, it’s creatures, customs, and yearnings.